Dr. Aaron Ambrad is a board-certified Radiation Oncologist and joined Ironwood Cancer & Research Centers in November of 2006. He is a first-generation Colombian-American fluent in both English and Spanish. Dr. Ambrad received his medical training at the University of Illinois College of Medicine. He then completed a Radiation Oncology residency at the University of Arizona Health Sciences Center in 2004 where he served as Chief Resident. Dr. Ambrad has specialized training in LDR, HDR, IMRT/IGRT, stereotactic radiation, as well as breast brachytherapy. He has an expertise and a particular interest in treating breast, prostate, lung, head & neck, GI and skin cancers. In addition, he has several publications for his work in brain cancer research. 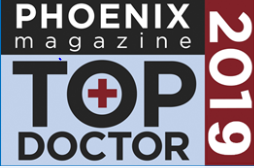 Dr. Ambrad is well-received and liked by his patients for his devotion and bedside manner and was recognized by Phoenix Magazine as a “Top Doc” in 2012, 2017, and 2018. Dr. Ambrad is fluent in English and Spanish.